Blog: Desk Phone | Avcomm Solutions, Inc. Tune out of a distracting environment, and tune into your work, with these headsets from Plantronics. Active Noise Canceling technology has crossed over to the business professional world, due to demand from professionals who require a space to concentrate, as well as headsets with noise-canceling microphones for premium call quality. The Active Noise Canceling (ANC) helps block out distracting sounds, creating a “quiet zone” to enhance productivity, no matter the environment. 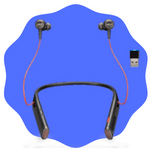 •	Neckband vibrates to signal an incoming call. All of these headsets, with the exception of the Savi 8220, come with carrying cases to protect the headsets in and out of the office. If you’re not sure which Plantronics ANC headset is right for you, give us a call at 1-866-998-9991, and our headset experts can help! Sennheiser office and contact center headsets are high quality products with premium sound, and the new SDW 5000 DECT wireless series is no exception. Sennheiser positions the SDW series as future-proof devices with flexibility for modern office professionals in modern work environments. Density and advanced security are the hallmarks of the series; a high density wide band mode assures excellent sound is possible in high density environments and the protected pairing, 128-bit authentication and DECT security certification keep conversations confidential. Choose between the SDW 5015 for desk phone and computer or the SDW 5016 for desk phone, computer, and smartphone/tablet. Remarkable noise-canceling mic: In our testing of the SDW 5016 (MSRP: $409.00), we were amazed at the exceptional noise canceling in the microphone. We walked through our noisy warehouse with the normal background sounds of people speaking and a cart being pushed and loaded with products among the shelves, and the noise was not transmitted to the person on the other end of the call. 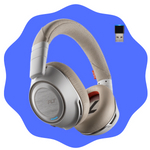 This is because of the headset's two-mic design and cutting edge voice-detection technology. If you work in a noisy office, this is the perfect headset. 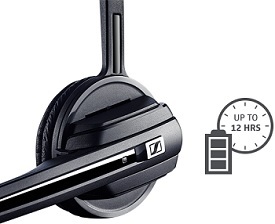 Warranty: Sennheiser wireless headsets are covered by a 2-year warranty, double the industry standard. 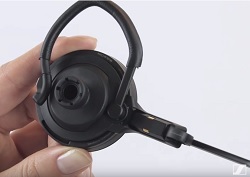 Videos: Sennheiser has produced a series of short YouTube videos that cover everything from how to assemble and wear the 3 included wearing styles* (headband, neck band, and ear hook), to how to handle, conference, and transfer calls. Another video highlights the different devices (USB and Bluetooth headsets and speakerphones) that can be connected to the SDW 5000 base. 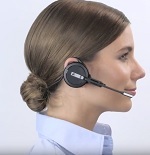 These videos are invaluable resources for SDW 5000 series headset wearers, who should bookmark the page for easy access: SDW 5000 Series Playlist. Free software for headset updates: HeadSetup Pro is the must-have companion software for all of your Sennheiser devices. The FREE software download is compatible with Windows operating systems. Download the software now: HeadSetup Pro. Sennheiser included a built-in triangular busy light on the mic boom that turns Red when busy; Purple when streaming music; and Blue when the headset is docked on the base. New to the Sennheiser product line is a Busylight designed for the SDW series. 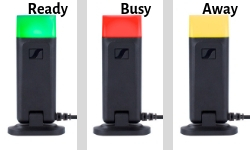 Connect it to the Busylight port (marked in blue) at the back of any of the SDW base units, and your presence is immediately indentified as Red (Busy), Green (Available), or Yellow (Away). It can be attached to a computer monitor, or placed on a desk. It is UC and Skype for Business certified. Ready to learn more about Sennheiser SDW 5000 headsets? Give us a call at 1-866-998-9991 and talk to one of our headset experts today! *SDW 5015 comes with the ear hook and headband only; the neck band is an optional, additional purchase. 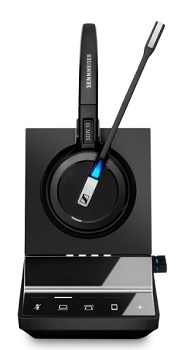 Sennheiser D 10 Wireless Headsets Now at a Lower Price! Sennheiser has lowered pricing on their single-connection wireless headsets, and it's time to take a closer look at this series. The streamlined design of the Sennheiser D 10 wireless DECT headsets makes no compromises when it comes to exceptional sound. Its single connectivity to either a desk phone or softphone/PC makes it easy to "plug and play" ... simply roll out and manage — the perfect headset solution for all sizes of companies. D 10 puts the freedom of a wireless solution within reach of even more everyday users. 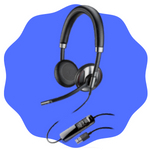 We recommend wireless headsets for businesses and contact centers alike, for several reasons. The freedom that a wireless headset allows — such as leaving your desk to grab a file, consult a colleague, or pick up a product from a product table to provide customer support — can all be accomplished while helping customers during the phone call. Placing someone on hold for extended periods of time is no longer necessary! Another benefit of using wireless headsets is the conferencing feature. Did you know that you can conference up to three additional wireless headsets to the same base unit, for a total of four users on the same call? Wow! No cords are necessary; the process is a simple docking on the main base unit during an active call, accept the additional headset(s) and boom! You're on the call. To end the conferencing feature, simply end the call and turn off all of the headsets. The headset comes with two wearing styles: ear hook and over-the-head band. A neckband is also available, as an additional purchase. 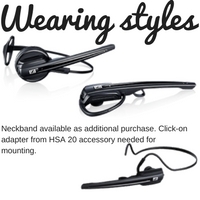 Please note, the click-on adapter from the HSA 20 accessory kit is needed for mounting the headset to the neckband. D 10 PHONE connects to desk phones. An EHS cable or handset lifter can be added to the order, so that you can answer and end calls away from your desk. Which one you need depends upon your desk phone; contact us and we can help determine what you need for remote answer capabilities. D 10 USB connects to a PC or laptop. Sennheiser software can be used to upgrade the headset firmware, which is available at no charge. The Software Updater can be found on Sennheiser web site; scroll to the Download End User version. 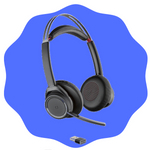 D 10 USB ML connects to a PC or laptop and is the Microsoft-certified headset for Skype for Business/Lync. It is fully compatible with the Microsoft platforms. With this new lower pricing, wireless headsets are a cost-effective option! The D 10 series from Sennheiser has a lot to offer — at a great price. Contact us today! “Do you have an Active Noise Cancelling headset that I can use with my desk phone?” is one of the top questions we’ve been receiving lately. 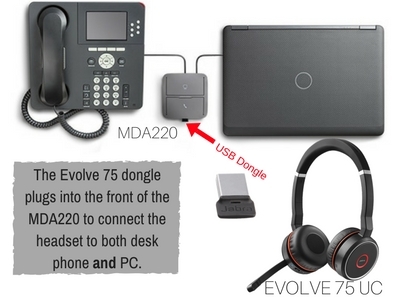 While all Active Noise Cancelling headsets so far are either Bluetooth or corded USB connection, with the addition of the MDA 220 adapter, employees are able to have the true concentration they need in noisy office environments that still utilize traditional desk phones. The Plantronics MDA220 USB (MSRP: $99) is an audio switcher that toggles between desk phone and PC and is great for those who are transitioning to Unified Communications and still need to use a traditional desk phone. 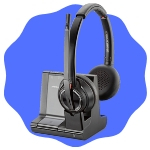 It allows the user to utilize the same headset for both their desk phone and PC. Avcomm has tested this solution and it’s one of our top recommendations for customers with this particular need. Connect the MDA220 USB with the two cords at the back of the device: an RJ9 cable to plug into either the desk phone's headset or handset port, and a USB cable for connection to the PC. The headset, or its USB dongle, connects into the USB port at the front of the MDA220 USB. EHS cables and handset lifters can be used with the MDA220 USB, to allow for remote answer/end from the headset. That would be an additional purchase, and would need to be compatible with the desk phone it's being connected to. You can toggle between the desk phone and PC by simply pressing the corresponding icon on the MDA220,which then illuminates solid green to indicate connection. The Jabra Evolve 75 UC has captivated us with Active Noise-Cancelling in the speakers, a noise-cancelling microphone, comfortable wearability for all-day use, and a hard-sided case for travel. In addition, this headset either comes with a charging stand, or without. This is what we use daily at Avcomm, and the set-up that we recommend to customers whose open office environments present a challenge when it comes to concentration and productivity. 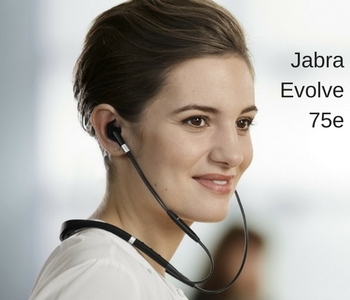 Another great option is the brand new Jabra Evolve 75e UC for those who prefer an ear bud wearing style. This headset also features Jabra’s excellent Active Noise Cancelling technology, an integrated busylight, and a protective travel case. Ready to embrace a 'cone of silence' with your desk phone? The MDA220 USB, along with an active noise-cancelling headset, will get you there. Wireless headsets by Sennheiser offer iconic design, all-day comfort and legendary Sennheiser sound. They allow you to move around freely and stay connected so that you can keep working - wherever you are. And you can count on clear sound even in the busiest work environment, both in and out of the office. The 2-year warranty from Sennheiser is twice as long as competitor warranties on wireless headsets, giving you peace of mind. You have options with Sennheiser wireless headsets. A few of the choices: mono or duo ear; noise-cancelling or ultra noise-cancelling microphones; a variety of wearing styles (over the head, behind the neck and over the ear); and various connection methods. If you're not sure exactly what you need, we're here to help! A few simple questions will narrow the choices and you will be using your wireless headset in no time flat! There are three great choices in this business office category: SD Pro 1, SD Pro 2, and SD Office. SD Pro 1 headsets are single-ear. Both UC and Microsoft versions are available. Switch between desk phone and PC with a simple touch on the base station. The extended wireless range allows for conversation in a radius up to 180 feet, and within line of sight, up to 590 feet away from the base. SD Pro 2 UC and ML headsets are duo ears. The supple leatherette ear cushions and adjustable headband give this headset a premium fit and feel, and the flexible mic boom with ultra noise-cancelling can be adjusted for best proximity to the mouth for excellent sound quality. SD Office has a FlexFit wearing style system with 3 wearing choices: headband, and earhook; a neckband is available for additional purchase. The fixed mic boom is noise-cancelling and filters out background noise. Both UC and Microsoft versions are available. All of the SD models let you answer and end calls, mute, and adjust the volume directly on these headsets. The headsets offer up to 8 hours talk time in wideband sound mode and 12 hours in narrowband mode. Proprietary technology includes HD Voice Clarity for natural wideband sound, and ActiveGard, hearing protection against acoustic shock. The headsets are interchangeable on the same base, to conference up to 4 headsets to the same base station! The video below provides a quick overview to the SD series. The Presence Business is a traditional Bluetooth headset, with incredible noise-cancelling. Callers won't know you're in the middle of a busy conference hall. We tested the excellent noise-cancelling of the Presence in a busy conference expo hall! MB Pro 1 and MB Pro 2 offer the stability of a headband, and a single Bluetooth connection to smartphones and tablets. A comfortable headband and soft leatherette ear cushions have a professional polish, and accomplish all the same tasks as the Presence - just with a different look. The office worker who makes most of their calls on their smartphones may appreciate the MB Pro 1 and MB Pro 2. The MB (Mobile Business) Pro series is the first to offer Room Experience technology, which reduces listener fatigue by giving all-day headset users the impression they are having a conversation with a person in the same room. This realistic sound provides a more natural and comfortable listening experience with less stress in noisy environments. For those who need the Bluetooth connection and a USB connection to PC, there are plenty of choices in this category. 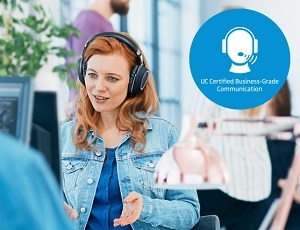 The MB Pro 1 UC and MB Pro 2 UC versions are a traditional headband style (also available for Microsoft: MB Pro 1 UC ML and MB Pro 2 UC ML); if you prefer the smaller profile of the Presence, there are 2 options: the UC and ML (certified for Microsoft Skype for Business). To focus on work, and not on distracting background noises, the MB 660 UC and MB 660 MS have large ear cups with Active Noise Cancelling. While there is no microphone boom, the MB 660s offer triple digital mics with Advanced Own Voice Detecting, WindSafe and Speak Focus technology for clear conversation. Out of the box, the D 10 headsets come with over-the-head and ear hook wearing styles; a behind-the-neck band is available as an additional purchase. These headsets feature a built-in ringer with a choice of three ringtones and adjustable ring volume. Noise-cancelling microphones and fast recharging: up to 50% of the battery in 20 minutes, also make these headsets a good choice for a single connection headset. Options are D 10 USB and D 10 USB ML, which is certified for Microsoft Skype for Business. 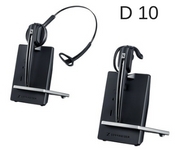 The D 10 Phone headset offers the same features as its USB variants, listed above, and connects to desk phones only. While this may seem overwhelming, with a few basic questions, we are able to narrow down the best Sennheiser wireless headset for the environment and user profile. Give us a call and we can assist you in your decision-making!